The Summer of No Pants, or SONP, is an annual skirt + dress sewing and wearing challenge. Along with my readers, I sew four skirts and/or dresses in the four weeks leading up to the first day of summer. This year the challenge runs between May 27th-June 21st. In that time, we share our creations in the SONP Google + Community, on our blogs and across social media. I invite some fantastic guest bloggers to share tutorials, reviews and round-ups. We also have some amazing sponsors who offer goodies and giveaways. Then, all summer long we swear off two-legged apparel and wear only skirts and dresses until the first day of autumn! This year BERNINA has pulled out all the stops by adding a Pinterest contest into the mix. The skirts and dresses that you make during SONP will be eligible to win a fabulous prize pack and the Grand Prize of a bernette 46! So, what do you think? Are you that kind of girl now? 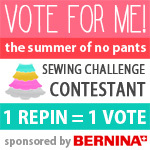 Read on for details on how to join in The Summer of No Pants and enter the BERNINA + WeAllSew Pinterest Contest. Please see the complete Official Rules before entering. Skirts and dresses must be sewn during The Summer of No Pants challenge, May 27th-June 21st, 2013, and submitted to the SONP Google + Community by 11:59pm EST on June 23, 2013. “People’s Choice” re-pinning ends on June 28, 2013 at 11:59pm EST. Post a link to your pin into the SONP Google+ Community under the category “BERNINA & WeAllSew Contest Submissions.” Your entry will be re-pinned on the official contest Pinterest board within 24 hours. Hideous! Dreadful! Stinky! will +1 your post once it has been pinned. You MUST post a link to your pin in the Google + SONP Community to be considered. Up to four entries per person. More SONP buttons and additional sizes are available here. If you don’t have a Pinterest account, you can sign up for one here. If you don’t have a Google + account, you can sign up for one here. Please note, the SONP Google+ Community is a public, moderated community. You will need to request permission to join the community and be approved by a moderator before posting. Sign up now so that you can post your submissions right away! People’s Choice – One winner, based on the most number of re-pins. 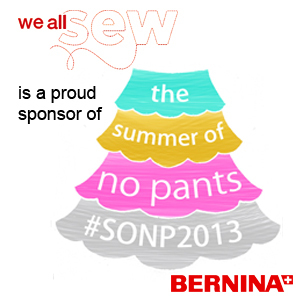 The People’s Choice winner will receive a prize pack of goodies from Summer of No Pants sponsors including BERNINA, Colette Patterns, and Craftsy. Please be sure to share the pin that appears on the official contest board, as only re-pins from that board that will be considered. Grand Prize – One winner, based on Judge’s Choice. 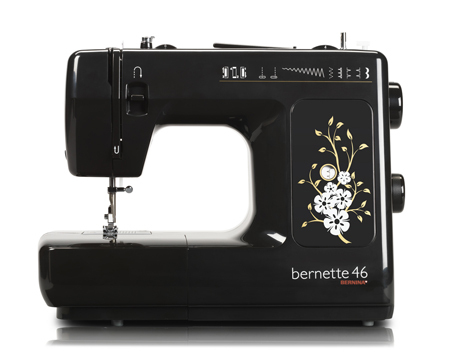 A panel of judges will choose one lucky sewist to win a BERNINA Bernette 46. Judging will be based on creativity, craftsmanship, fit and use of fabric and color.